Give your favorite golfer a dapper dose of style with these cufflinks, crafted from PGA-licensed gold balls. Just because the ball missed the green doesn't mean it can't get a second wind. 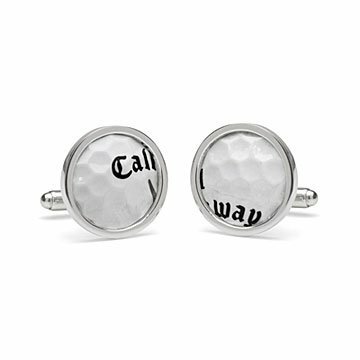 Set in sterling silver, these chic cufflinks are crafted from PGA TOUR-licensed golf balls that were plucked from the famed 17th Island Green water at TPC Sawgrass, Ponte Vedra Florida. Give them to your favorite golfer for a dapper season spent on the green. Officially licensed by PGA TOUR. Made in Mexico. Each set can be verified here and come in a black gift box for handsome appeal. Please note we pull a variety of balls from the water, so manufacturer and ball number may vary from what is pictured. Visit our blog to see how sunken golf balls are recovered to create these cufflinks. Disappointed when the MTA filled in the "Y" cutout of their classic subway tokens, Ward Wallau was inspired to find a fun way to incorporate the unaltered tokens into cufflinks. He wanted to prove to the MTA that the original tokens were worthy of celebrating and repurposing and, after 11 years of "no," Ward became the first licensee of the New York City MTA. Since that time, this "authenticity hound," has assembled and grew his team of artisans, production staff, and authenticators in Berkeley, California, where they re-imagine nostalgic artifacts as unique gifts that tell a story. Ward loves breathing new life into things that already exist, be it letterpress blocks, a wooden seat from Wrigley Field, or a bat broken at a Major League baseball game. "This business is ever-challenging, dynamic, and satisfying," he says. "It's not a good day if you don't learn something new!" My friend loves his gift and showed them off to all his friends. Definitely would purchase these cuff links! Love the Titilist writing on the cuffs! I got this as a gift for my dentist. He loves golf and I wanted to get him something unique. This will be a gift for my soon to be hubby on our wedding day. He is an avid golfer and will love it. Husband hard to buy for, loves golf. Started to wear these cuff links the next day. And he gets tons of comments on them! My boyfriend liked these!! I hope to see them when we go out sometime soon! a fun and unique gift!